I was walking through my little downtown village yesterday on my way back to my car after a lovely respite of coffee and a stroll with a friend when I passed by a woman walking alongside her young son riding on a little scooter. I couldn’t help but notice the two as the boy had stopped abruptly and was blocking the narrow sidewalk, forcing me to move around him. As I was walking past them, I noticed his mother lean down and take a photo of the scooter with her phone. I only took a quick glance at this as I was quickly walking by but I couldn’t help but wonder why the mother was snapping a shot of her son’s scooter. Was she about to chronicle her afternoon in town with her son on Facebook? Was she creating some type of artsy image for her Instagram followers? Was there some critical component of her son’s scooter that needed to be repaired and she needed to take a photo of it to be sure she recalled it correctly? Whatever the case, it made me think about the amount of time we spend caught up with our devices, capturing and chronicling our life experiences rather than, perhaps, actually experiencing them. Last weekend, when we were in Boston, we attended a Major League Lacrosse game at Harvard University. Because both my husband and kids are big lax fans, this was the cornerstone of our trip and we did it in style. We got seats on the sidelines which allowed us to be just feet away from the action. Almost like sitting court side at a basketball game, aside from the aluminum fence protecting us from wayward lacrosse balls, we were practically in the game. Even I, the least obsessed fan in the family, was caught up in the excitement of being so close to the action. When players ran out-of-bounds and bumped into the wall just inches in front of us, I gasped with both awe and just a little bit of fear, expecting that I was going to get pummeled by some of these big boys. Despite our proximity to the game, I found myself spending a good portion of my time taking photos on my phone to try to capture the experience. What I recognized, even at the time, was that my iPhone camera did not have the capability of showcasing how close we were to the game and that I simply could not zoom in enough to replicate what I was able to see with my eyes. Unlike many other events where you can close in on something that would otherwise be difficult to see, in this case, my photos were actually distorting my perfect view. Nonetheless, I felt the need to log all of this for my social media followers. It seemed like the event would become a non-existent memory if I did not have a phone full of photos to prove it. I thought about how I might use these photos or if, like many others, they would sit on my phone until such time that I deemed it appropriate to delete them. Right before we left for our trip, I upgraded to a new phone with less memory and had to go through the task of deleting many of the more than 1,500 photos I had stored. As I went through picture after picture, I was puzzled as to why they were even taken (surely some random Facebook post) or why I had not deleted them sooner. When I left the game, I figured I would download my new collection into iphoto on my computer so we could look back at them years from now, Most likely, though, in a year or so I will wonder why the hell I took so many damned photos of the game when I could not even make out the number or names of the players. I’d be puzzled by the 20 shots I took of the very same guy just to see if I could get him catching the ball on the run. Would my memory not be able to store this information? Could I possibly share this story with others with words, rather than pictures or did the photos make the moment? Would the memories evoked from the photos actually be reflective of the real experience or would they create some type of contorted image losing so much of the richness and reality of the actual experience? Living in the present – in the real here and now – is often quite challenging for me because my life has so many different compartments. I travel often for work, have lots of different groups of friends and feel like my life exists in so many different places. While my heart is always firmly placed with my family, I often find myself thinking about wherever I am not or whomever I am not with. I miss my family like crazy when I am out-of-town and I pine for my friends and colleagues when I am at home. More than just the typical working mother complications, my experience goes far beyond the guilt of not being able to devote myself completely to one thing or another. I experience a bizarre “grass is always greener” existence that usually leaves me floating on a plane above my life and several degrees away from actually living it. I always think about how I can capture various moments to go back and visit with them when longing strikes but wonder what exactly it is I am storing away for safe keeping. I do appreciate the value of having recorded memories and have a rich display of beautiful photographs of treasured times throughout my house. I will often linger beside the sofa table in my living room, recapturing moments of special occasions as I stare at the photos, tucked into hand-selected frames. My mind will wander back, trying to find the thoughts or feelings in the eyes of those photographed, allowing me to experience, once again, the wonder of those moments. But, of course, those memories are fleeting and they only capture a split second in time. They are not true reflections. They are filtered through the lens. Yesterday, when I got into my car after seeing the young boy and his mother, I thought less about my own bad habits of looking at the world through my camera lens and thought more about how much I am separated from my life even when my phone is safely tucked away. I have made it a habit recently to keep my phone at a distance so as to not spend all my time looking at social media, in search of who might have texted me or checking up on the pesky emails that find their way to me all day and night. I have tried to untether myself from the 21st century equivalent of checking my answering machine to see if anyone has called. They can wait. My children cannot. My life cannot. The other night we were dining with friends and, as we sat outside on their deck, catching up after not seeing each other for quite some time, I found my mind wandering to other people in my life, wondering what they were up to, thinking about how long it had been since I had spoken to them. I caught myself and immediately refocused. I felt guilty about letting myself stray and not offering my undivided attention to these very important friends who I so looked forward to spending time with. Just days before I had been daydreaming while I sat with my kids at the pool, wishing I could see these friends and now, here I was, allowing my mind to wander off once again. I’m trying to honor my life and see every experience as a gift. 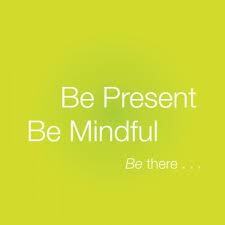 Being able to be present in every moment is a challenge but the payoff is so rich and rewarding. Letting go of everything except what is happening right here, right in front of me, is a truly blissful state and one that eludes me most of the time. But I keep trying. It is hard to discipline myself to experience my life rather than capturing it digitally and I acknowledge that the reality that I experience through my iPhone is somewhat a distorted version of the truth. I will continue to balance my desire to be able to look back and reflect on those special moments and be able to peruse through files of images to relive some wonderful times with the need to actively engage in my life. I recognize that the best possible way to actually experience my life is to be present and living it, looking at it through my own two eyes, rather than through the somewhat misleading looking-glass. It seems many of us (and when I say many, I am referring to my significant research conducted while reading Facebook posts on New Year’s Eve) were very happy to see 2012 go away. In fact, some were shooing it away as quickly as they could. I was definitely part of that crowd. 2012 started out rather poorly and, unfortunately, there were far too many moments that would fall into the category of events that I would prefer not to include on my highlight reel of life. Despite this and even though I was anxious to see the year end, I was determined to close it out on a high note, making way for a very positive and optimistic entry into the new year. On Monday afternoon I began my decidedly low-key new year’s eve celebration by going to a movie with a friend – frankly, it seemed somewhat odd to go out to a movie during the day when everyone was prepping for their big NYE spectacular celebrations but it was just right for me. Afterwards, my younger son, who had been cooped up in the house for days with a cold, asked to go out to spend some of his holiday gift cards. I obliged, again thinking that this was an odd activity for the day but committed to keeping my expectations of the day low with a hope for great outcomes. We took a little drive to some stores to find even more video games and toys because the ones he received on Christmas were simply not enough to sustain him through, um, let’s see…December. All in all, it was simple, easy and pleasant. The quiet time in the car on the return home from shopping left me some space to contemplate the results of the soon-departing year. I was waiting to turn on one of the various jug handles that signifies you are driving in New Jersey and I heard an interview on the radio with yet another person expressing their relief that this year was coming to an end. I know we had a particularly rough last quarter of the year with Hurricane Sandy, the Sandy Hook shooting and a scary fiscal cliff but, even with all that, it suddenly struck me as odd that so many people were overwhelmingly grateful to move into the next year and kiss the current one goodbye. And, in truth, it was not just year that I noticed this phenomenon. I wondered why we so often end the year this way. It is great that we are optimistic for what is to come, hopeful for a better result, wishful that the good will outweigh the bad. But, it feels as if when we get to the end of the year we spend a great deal of our time focusing on our regrets and shortcomings. Certainly life is really not all that bad. Perhaps we tend to use the new year as a moment of cleansing to rinse away the muck and make room for all the bright shiny new opportunities. Of course, we all have misfortune – it is part of the ying and yang of life. There is no such thing as having a perfect life and even those of us who live with intention and make a great effort to focus on positivity have struggles and moments when life pulls us down. It is natural. It is unavoidable. As I was pondering all this it made me think hard to summon a year that ended with me sad to say goodbye. I had to do some deep reflection. I suppose the years when my children were born I was still aglow from their arrivals – especially since they were both born towards the end of the year. I doubt I ended those years on a low note but, of course, I was also probably too sleep-deprived and overwhelmed with the business of dealing with newborns to indulge in such reflection. In truth, I think that I (and probably some of my fellow year-chuckers) tend to welcome the excitement of the new year and the promise it holds by justifying and balancing its arrival with the dismissal of the current year where there is no more mystery and the story has been revealed. We know the outcome. We can see the crappy moments and the less-than ideal circumstances. We know what we are tossing away while we can wistfully hope for something better in the new year. I posted on Facebook on Monday that I was borrowing my friend’s ritual of writing down my top 10 list of bad stuff from the year and burning them in the fire to ensure their permanent departure. It was my own version of smudging my year. I loved the symbolism of releasing any negativity into the fire, freeing up space for positivity and possibility. But, alas, I am not ignorant or naive. I know that the coming year will bring its own set of struggles and disappointment and I might very well end up on December 31, 2013 lamenting those less fortunate experiences and, once again, be anxious to welcome a fresh start in 2014. The activity of throwing our disappointment into the fire seemed very cathartic to me but I feared it would be a ritual that would yield only short-term results. Then, today, once again thanks to Facebook I saw something that possibly solved my conundrum about how to end the year on a positive note rather than toss the baby of regrets and disappointments out with the proverbial bath water. While this has seemingly gone viral, I thought it worth sharing yet again. Someone has suggested creating what I refer to as a celebration jar where you jot down on a scrap paper all of the wonderful things that you are grateful for throughout the year and place them in the jar. On December 31, you can open the jar and read off all of those delicious memories and experiences and acknowledge the positivity in your life. So, even if you are excited about the promise the new year offers, you do not have to walk away from the current year sighing in relief that the torture is ending. This enables you to build goodness on top of more goodness, resulting, hopefully, in a sustainable happiness that can translate from year to year. Rather than lamenting and being awash in disappointment, this is a beautiful way to remember those spectacular moments – big and small – that made your year special and impactful. All of this inspired me to think deeper about the shared comfort so many of the people in my circle felt as we turned the calendar page and put 2012 behind us. Perhaps it is easier for us to focus on the negative aspects because we are simply wired that way. As a society, we certainly tend to dwell more comfortably on negativity because focusing on the good stuff feels indulgent and, frankly, sometimes scary. It is as if we will jinx ourselves if we believe that good is the norm rather than the exception. And, at the same time, so many of us set intentions for goodness and positivity and still fear it when it comes because it might only be temporary. There is a fear that if we allow ourselves to embrace the goodness in our lives, we may set ourselves up for disappointment when things go wrong. It is human nature. The Celebration Jar allows us to chronicle all the wonderful moments throughout the course of the year and then safely and joyfully reflect on them as we wave goodbye at the end of the year, perhaps with a sense of accomplishment and wholeness knowing that, even though we may have faced struggles and challenges and unpleasantry, we also had some pretty amazing times. The truth is we always do. We just need to hang on to them a little bit longer. Here’s mine. Hope you create one too and embrace 2013! “I love to see a young girl go out and grab the world by the lapels. Here’s the deal. I am getting more and more frustrated when it comes to talking about equity for women in the workplace. The statistics are not improving, women are opting out more than ever before and I have to wonder if there is a real solution to the increasing challenges women face in terms in having equity in the workplace. For years I have been studying this topic. Back in the early 2000s when I worked at Working Mother Media, we looked at the topic from the lens of working mothers and struggled with the notion of workplace flexibility. It’s disappointing and scary that nearly 10 years later we are having the very same conversations and nothing has improved. I have to ask the question of why. Yesterday, as I was partaking in my daily ritual of tweeting and catching up on all the current news I can absorb in 140 characters or less, I came across the youtube video of Facebook COO Sheryl Sandberg’s 2010 TED talk on why we have so few women leaders in the world. Coincidentally, on this same day, I came across on Facebook, courtesy of my friends at Flexpaths, a story from CNN about Sandberg admitting that she leaves work at 5:30pm. Why is this news? In my opinion, if it was about a male Fortune 500 CEO confessing that he slips out of the office early to spend time with his kids or attend their soccer games, that would be groundbreaking and would set a different tone, certainly in his workplace. In reality, however, Sandberg telling her story is the equivalent of preaching to the choir. Despite the fact that she is a powerful and busy COO, she is still a woman and it is expected that she would figure out a way to try to balance work and family. I’ll add to this my own stats: Less than 3% of the Fortune 500 CEO’s are women. (Although, curiously, of the 100 most successful companies in the world, 6% are run by women which makes me wonder if they are more successful because of the greater presence of women leaders….). Women represent only 16% of equity partners in law firms and 16% of the seats in Congress. 16% has long been this magical number for women. We seem to hover right there in terms of significant representation. When we look at Board seats, the answer is 16% representation by women. Let’s face it, this is all terrible news. In the 10 years since I started tracking this data at Working Mother, nothing has changed. Nothing at all. Well, nothing except that the problem is getting worse because we are not making any headway. Sandberg suggests that there are several critical issues that need to be addressed in order to change the reality for women in leadership. First of all, we need to keep women in the workforce to ensure that they ultimately gain access to the high income jobs. We know that women are opting out of the traditional workforce at higher rates than ever before. Whether it be to stay at home and raise a family or to start their own businesses, women are not willing to play the game. 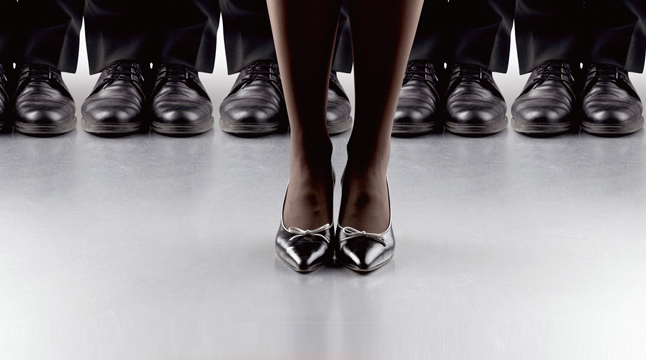 This exodus from corporate jobs creates a void of potential women leaders. Of course, we should celebrate the fact that women feel empowered to change their career paths, take risks and become entrepreneurs but this fact is hurting our economy because there is no doubt that women leaders yield strong business results. Without a rich talent pool to draw from, businesses suffer and lose the opportunity to both increase gender equity in the senior ranks as well as benefit from the strengths that women uniquely bring to the table. Another challenge Sandberg identified as an obstacle for women is that they underestimate their own abilities. This is one I can certainly relate to on a personal level as I am sure many women can. It is very hard for women to promote themselves in the same way that men do. Sandberg cited research that suggested that while men will frequently take credit for their own successes, women often attribute it to other influences or the fact that they got lucky. In addition, women are less likely to negotiate for themselves when it comes to compensation which directly results in the gender disparity in pay. It has been reported that 57% of men negotiated their first salaries compared to only 7% of women. (I shared this stat with a group of women this morning and, after shaking their heads they agreed that this is very accurate.) Sandberg attributes a lot of this to social influences because, as a society, there is certainly more pressure and expectation put on mean to succeed. Stay-at-home dads are not always celebrated and working moms are often criticized. Women are challenged with the likability factor, which is a key obstacle as well. Success and likability are positively correlated for men while it is negatively correlated for women. In other words, the more successful a women, the less likable we perceive her to be. Sandberg cited one study that illustrates this phenomenon perfectly. In it, Columbia Biz School prof Frank Flynn and colleague Cameron Anderson at NYU offered their students a case study of a successful Silicon Valley venture capitalist named Heidi Roizen. But she was only called Heidi in the case study given to half their students; in the other, Heidi became Howard. While the students rated Heidi and Howard equally competent, they liked Howard–but not Heidi. In fact, according to a synopsis of the study, students felt Heidi was significantly less likable and worthy of being hired than Howard. Why? Students saw Heidi as more “selfish” than Howard. The final factor that Sandberg cited was that women often leave before they leave. Ironically, the actions women take to try to stay in the workforce ultimately lead to them leaving. For instance, if a woman is thinking about starting a family or is recently pregnant, she is likely to pass up opportunities for stretch assignments or promotions. Recognizing that she will have to step aside for a period of time after the birth of the child, a woman tends to feel morally obligated to say no rather than take on the assignment or new role and deal with it when the baby is born. As a result, between pregnancy, maternity leave and the ramp-up period after returning to work, women are often losing close to 2 years of opportunity for engagement and advancement in their careers as a result of building their families. We are doing this to ourselves because we tend to lean back even when we are thinking about having a baby. These rules need to change. Overall, the most concerning part of Sandberg’s talk, for me, was her realization that this generation will never see equity in the workplace. The divide is still so great and we simply do not have the time or the numbers to make up the difference. It is up to the young women – and men- who are just now entering the workforce to change the game. And it is up to today’s leaders to be open to look at the problem differently. Women are always going to have babies and, even though we know that only 1/3 of executive women have children compared to 2/3 of executive men, that is not going to change. In fact, we know that millennials are even more interested in having families and want to do so at a younger age. They reject the idea that women need to establish themselves before they can start a family. Perhaps the corporate culture will change their thinking about that but I hope the millennial women – a sizable force to be reckoned with – will buck the system and prove that career and family are not mutually exclusive for women or men. And, most importantly, it is time for the guys to have a voice in this revolution. The men are still in charge and have the power. By becoming role models for how we look at work and making sure to support women as they climb the corporate ladder and navigate the challenging terrain of carrying on the human race while also helping to keep the economy afloat, men are perhaps the secret sauce. We often keep them out of this conversation as if they are our mortal enemies but, perhaps, they are the allies we have forgotten to embrace. I am going to keep pining over this issue and will keep getting on my soapbox about it and, hopefully before my voice gets too old, I will see some real movement in these numbers. In the meantime, we will continue to develop programs to support women and the men that can change their fate. Stay tuned for some cool new programs coming from Ingenium Strategies to help build our future women leaders!